The Settings app is one of the most important on your phone, as it’s where you customize and control everything your device can do. But it’s also one of the most intimidating apps, given its many menus and sub-menus; as such, many people never realize when those options change. Here’s a look at what’s new and different in Settings in iOS 7, organized in the order in which sections appear on the app’s main screen. As happens in every new version of iOS, the Settings app’s main screen has undergone some minor renovations that don’t really affect its functionality. The icons have adopted iOS 7’s flat-but-colorful look, with new designs for all top-level settings, and Apple has slightly tweaked some names—for example, iOS 6’s Brightness & Wallpaper item has given way to Wallpapers & Brightness in iOS 7. One change here, though minor, is nevertheless useful: iOS 6 and earlier listed all available networks under the Choose A Network section, with a checkmark designating the connected network. Your current network is helpfully listed separately from other available Wi-Fi networks. 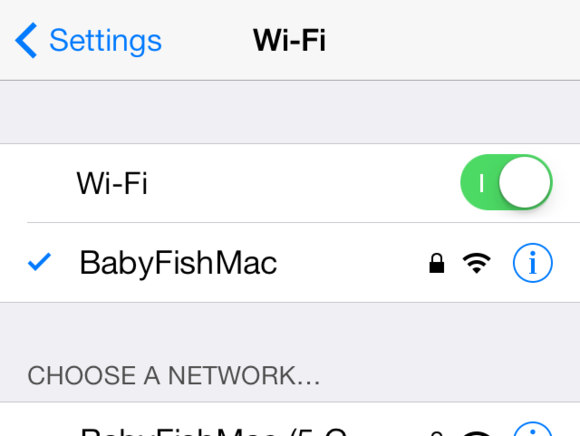 In iOS 7, your connected network appears at the top, just below the main Wi-Fi toggle, with all other available networks shown in the Choose A Network section. It’s a more logical organization that also makes it easier to quickly determine your current network. If the network in question is provided by an AirPort base station, and you have Apple’s free AirPort Utility app installed, you can quickly tweak the base station’s settings from here: Just tap the network’s info icon (the i to the right of the network name), and then scroll down the screen that appears and tap Manage this Network. You’ll need the base station’s administrator password to make changes. If you’re using an iPhone or iPad with cellular data, you’ll see the Cellular screen on the top level of the Settings app; previously, it was hidden under the General section. Cellular continues to feature Cellular Data, LTE/4G, and Data Roaming toggles, along with a menu for setting up a Personal Hotspot. In the Cellular screen, you can see the total amount of roaming data you’ve used, as well as choose which apps can use your cellular-data connection. In addition, Cellular now shows your overall and roaming cellular-data usage (previously found under General in the Usage screen), and those numbers combine uploaded and downloaded data, rather than separating them into Upload and Download. This approach is especially useful for frequent travelers with a data budget, as you can quickly see the total amount of data you’ve used when roaming. You can reset these statistics by scrolling to the bottom of the screen and tapping ‘Reset Statistics’. The Cellular screen also lets you choose which apps get to use cellular data when downloading information, and which will be restricted to Wi-Fi downloading. By default, all apps can use cellular, but you can turn an app’s cellular-data access off by tapping the toggle next to its name. Tap System Services, found at the bottom of the list of apps, and you see a list of system services that use cellular data along with how much data each service is gulping. You may also see an Uninstalled Apps item at the bottom of the app list. 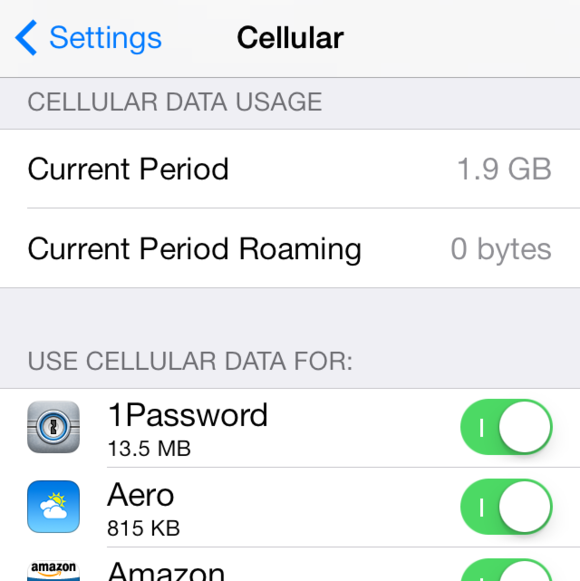 If you’ve recently deleted apps that use cellular data, this item shows how much data those apps used during the current period. The Notification Center screen boasts several changes: For one, there’s its new name, which replaces the old Notifications listing. The settings for Do Not Disturb have moved and appear as a separate item on the main Settings screen, below Notification Center and Control Center. You can choose which information appears in the new Today view. The other big change relates to Notification Center’s new Today view, which lets you view various pieces of information about your upcoming day. 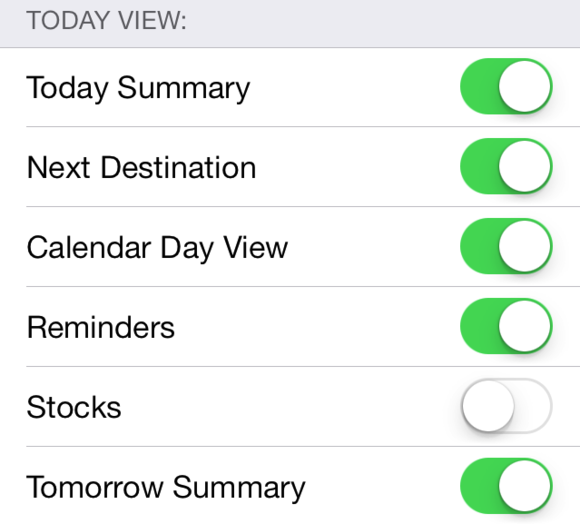 Here you can adjust the information displayed by enabling or disabling a summary of the day, your upcoming calendar events, reminders, tomorrow’s events, and (on an iPhone) your next destination and stocks status. You can also choose whether you can see the Today view—or Notification Center’s other views—on your lock screen. The app-specific screens within Notification Center have also undergone minor reorganizations, but the actual settings on those screens haven’t changed. Instead of In Notification Center and Not In Notification Center sections, the app now uses the phrases Include and Do Not Include. In addition, you may spot a section that allows you to enable and disable Amber and emergency alerts, depending on your carrier. As mentioned in the Control Center section earlier in this chapter, this screen of Settings has two simple toggles for choosing whether you can access Control Center from the lock screen or within apps. Do Not Disturb has graduated to its own preference screen in iOS 7, shedding the top-level switch and notifications section it had in iOS 6. A new Manual switch lets you enable the feature at any time. In addition, you can now choose to silence calls and notifications only when your device is locked. With this option enabled, if your device is unlocked—in other words, if you’re actively using it—you’ll continue to hear calls and notifications, regardless of your Do Not Disturb setting. Apple has reorganized the “settings that don’t fit anywhere else” screen, removing several preferences (Cellular, for one) and replacing them with a couple new screens. ABOUT The only change in the About section is the absence of the Advertising item, which has moved to the Privacy screen within Settings. SIRI If you speak English, French, or German, you can choose between a male or a female voice for your device’s personal assistant. TEXT SIZE A new Text Size setting lets you choose your preferred reading-text size for apps that support iOS 7’s new Dynamic Type feature. ACCESSIBILITY The Accessibility screen gets a number of tweaks in iOS 7, including one major new feature called Switch Control. This feature lets someone with physical or motor challenges use a connected accessory to sequentially highlight items on the screen and activate the desired item. Under this heading, you can configure switches; tweak signal timing, stabilization, and scanning; and toggle audio and speech feedback. Also in the Accessibility screen, under VoiceOver, there’s a new Use Sound Effects option. Instead of the Use Phonetics on/off toggle of iOS 6, you now get a Phonetic Feedback feature that lets you choose between Off, Phonetics Only, and Characters And Phonetics; and the Braille screen gains a bunch of new options. The Rotor feature gets a few additional items (sounds, hints, handwriting, and containers), and there’s now an option for Large Cursor. Back on the main Accessibility screen, the Larger Type setting replaces iOS 6’s Large Text feature, and it now offers a text-size slider rather than a list of numeric text sizes. And the On/Off Labels feature adds little On (|) and Off (o) icons to on/off sliders across the OS. Under the Hearing section, a new Subtitles & Captioning entry lets you enable, and choose the style for, closed captions. In the Guided Access screen, when this feature is turned on, you can now enable the Home button triple-press shortcut directly. (You can still enable it at the top level of Accessibility under Accessibility Shortcut—formerly Triple-Click, which adds an option for the Switch Control feature.) Apple has removed the Enable Screen Sleep feature, as well as the Incoming Calls setting, which on iOS 6 determined whether incoming calls would default to an external speaker or a headset. The accessibility options for tweaking iOS’s appearance are useful for everyone. 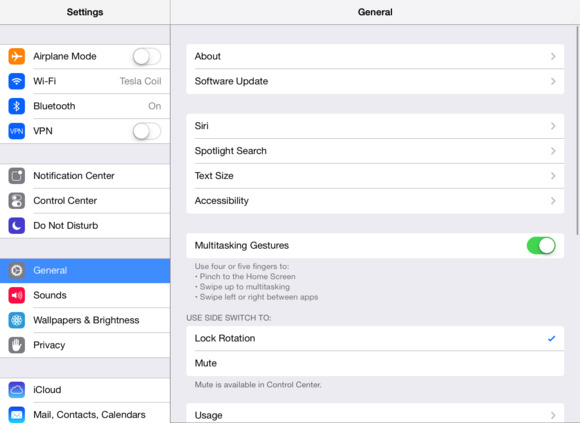 Also in Accessibility, but useful for everyone, are a few settings that let you tweak iOS 7’s appearance. The Bold Text option makes all interface text slightly thicker and darker; interestingly, enabling this feature requires a restart of your device. A new Increase Contrast option makes iOS 7’s new translucent-background interface elements a bit less translucent, rendering text and controls a bit more readable. Finally, a new Reduce Motion option reduces the parallax effect of icons and alerts across the OS. USAGE Gone is the Cellular Usage screen, which Apple has moved to Cellular; additionally, some iPods may no longer show a toggle for displaying battery percentage in the menu bar. BACKGROUND APP REFRESH New to iOS 7, and part of the operating system’s improved multitasking support, the Background App Refresh screen lets you toggle the capability for apps—including stock apps such as Weather on the iPhone, as well as third-party apps such as Instapaper and news apps—to update their data in the background. The Background App Refresh screen lets you choose which apps can automatically refresh their content in the background. PASSCODE LOCK In the Passcode Lock section on an iPhone, a new Voice Dial option lets you prevent voice dialing when the screen is locked. RESTRICTIONS The Allow section loses the former toggle for Explicit Language, but gains a setting for allowing AirDrop transfers. iOS 7’s Restrictions options now let you prevent explicit language and web searches when using Siri. The Allowed Content section now includes options for limiting Siri (you can disallow explicit language and Web-search content, and the latter includes Wikipedia, Bing, and Twitter) and websites (you can limit adult content, or you can allow only specific websites that you choose). The Privacy subsection now allows you to control which apps can access or use your iPhone’s microphone(s), and offers an Advertising opt-out setting. A new restriction prevents users from changing the Background App Refresh settings. INTERNATIONAL The International section now offers two additional languages, Español (Mexico) and Australian English, as well as a number of additional region formats. iTUNES WI-FI SYNC The screen now offers a list of all computers your device syncs to, along with what kind of information it syncs and when you last connected it. There’s one new option here: You can choose the alert sound you hear when someone tries to send you a file or data using AirDrop. In addition, iOS 7 brings an entirely new alert soundscape to your device: earlier iOS sounds have been banished to a Classic folder in favor of 26 new ringtones and 12 shorter tones. As previously mentioned, this section got a name change (from Brightness & Wallpaper), but it’s otherwise largely unchanged from iOS 6. In iOS 7, you can now use a dynamic (moving) image for your home-screen or lock-screen background. 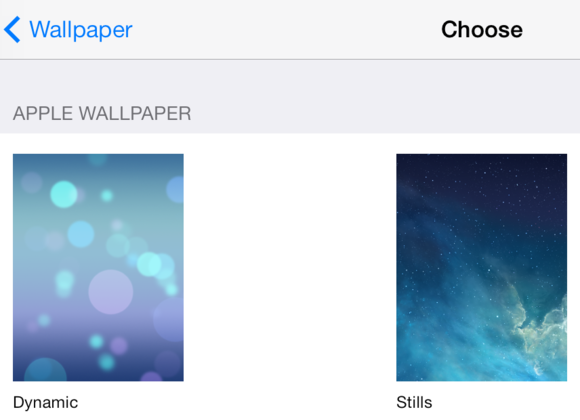 The one exception is that in iOS 7, you can now choose dynamic wallpapers that appear to move dramatically as you move and tilt your device. Apple provides just seven dynamic wallpapers, but you can add your own by taking panorama photos on your device or by creating images on your computer. SYSTEM SERVICES This section, located at Privacy > Location Services > System Services (scroll all the way to the bottom of the Location Services screen), loses the Genius for Apps toggle. New here is the Popular Near Me setting, as well as the Frequent Locations screen (see the next item). FREQUENT LOCATIONS Under Privacy > Location Services > Frequent Locations, Apple has added a way for your device to learn about the places you visit frequently (and, thus, provide location-related information and assistance). iOS 7 can remember frequently visited locations in order to provide location-related info and assistance. You can view saved locations in the Settings app. When you first upgrade to iOS 7, your device prompts you with an alert asking to remember the routes and places you visit; if you allow this, the Frequent Locations setting begins saving information to your device and anonymously transmitting it to Apple. In theory, this setting should provide you with better map data and routes, and possibly even information for Notification Center’s Today view. 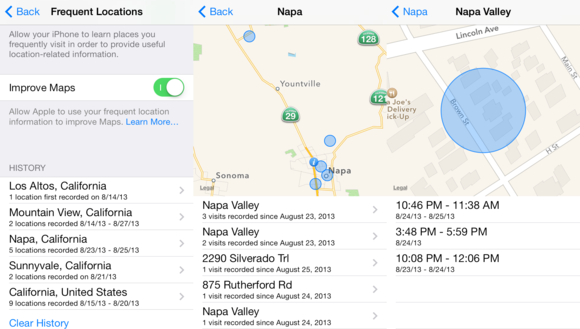 However, if you’re uncomfortable with recording this level of data, you can turn this feature off at any time by visiting the Frequent Locations screen; alternatively, if you want to take advantage of the feature but not send your data anonymously to Apple, you can simply switch the Improve Maps toggle to Off. If you decide to leave it enabled, Frequent Locations uses Wi-Fi, GPS, and cellular data to determine the locations you frequent, as well as when you visit. You can even view a list of all your places and times visited, broken down by geographic areas. Tap Clear History to clear your current location history and start anew. MICROPHONE: Your device now asks apps for permission whenever a new app wants to use the microphone. ADVERTISING: Apple has moved the setting for limiting ad tracking from the About screen to Privacy. You can enable it to prevent advertisers from tracking you with cookies and other location-based options.